SAN FRANCISCO: Mazda has offered the MVP minivan for years as an alternative to the mainstream minivans. 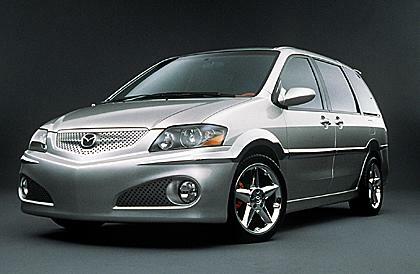 But as competitors remodeled, the MPV rolled along with minimal change. Finally, for 2000, a totally new Mazda people mover is ready for inspection. The MPV's new design fits right in with the going trends - the body wears the mixture of curved surfaces and sharp edges favored today. Mazda calls its corporate design philosophy "Contrast in Harmony." Pointy grilles are increasingly popular, and the new MPV flaunts one with five points. Resembling the hot new Honda Odyssey, the MPV wears chiseled fenders, tall tail lamps and a sharp window line. My tester, in a deep black, also had the GFX package, which includes front and rear spoilers and aerodynamic sills. My colleague, Ken, dubbed it the "Darth Vadermobile." When you're not the volume leader, you add value. The MPV is available in three levels, starting below $20,000 in the DX version. This is no stripped model - it throws in an automatic transmission, power steering, air conditioning, tilt wheel, intermittent wipers and an air filtration system as standard. The midrange LX starts at $22,040, and adds anti-lock brakes, power locks and windows, heated power mirrors, privacy glass, cruise control and more. The top level ES model bases at $25,540, but gets leather seats and steering wheel, cabinet-quality wood-tone trim, rear air conditioning, side airbags in front, a nine-speaker sound system, and 16-inch alloy wheels. Every MPV gets the same 2.5-liter four-cam V6 under hood, which delivers 170 horsepower. The high-tech engine pulls the 3,600-pound car along remarkably well. Fuel mileage figures of 18 city and 23 highway are acceptable for people movers. Surprisingly, the MPV achieves Low Emission Vehicle (LEV) status in California. As befits a sibling of the Miata, the MPV handles better than a typical minivan. The MacPherson strut independent front suspension and torsion-beam-axle rear suspension gives the MPV poise, as I discovered during some winter rainstorms, when only the pounding of water on the windshield tipped me off to the terrible weather outside. Perhaps the MPV's greatest selling point is its elegant interior. Thanks to Mazda's OptiSpace design philosophy, it's enormously comfortable and spacious, and light interior colors open it up even more. The slightly angular dash panel blends into the sculpted door panels in one continuous flow. The Japanese-built MPV features fine quality of materials and painstakingly perfect assembly. The sound system and climate controls live in a particularly finely rendered high-mounted panel. Storage spots are everywhere, including a front passenger underseat drawer, a generous glove compartment, and a center console bin that holds a dozen CDs. Any beverage may be consumed by any passenger and there'll be a holder for it nearby. Seven folks ride comfortably in the MPV, especially with unique features like the "Side-by Slide" removable second-row seats that let you, with a quick push, open up the way to the third row seats and also enable you to group or separate your kids. The seats weigh just 37 pounds each, so they pop out easily, and you can create whatever combination of people and luggage space you want. The third seat folds flat into the floor. I've never been a fake wood fan, but Mazda's wood has a prettiness that's surprising in a minivan. The entire interior layout is sophisticated, clean and practical. The controls have a fine tactile feel and creamy-smooth operation. The firm seats offer real support and sprout fold-down armrests too. Middle row passengers can roll down their windows in the lightweight dual sliding doors, something riders in other minivans can't do. Mazda has taken inspiration from Chrysler and hidden the door slide tracks in the window channels for a cleaner finish. My tester's 180-watt, nine-speaker "Super Sound" system brought to mind the "concert hall" clich�. It's standard in the ES model, and features a six-disc "in-dash jukebox" CD changer. Parking the MPV in your driveway and running the sound system could be a very pleasing pastime. Column Name: "Contrast in Harmony"